Every woman deserves a massage: Mothers, sisters, daughters, grandmothers, wives, girlfriends and co-workers! It's the perfect gift for any lifetime event. You can pick up the certificate. You can mail a check and in return a certificate will be mailed to you or the recipient. 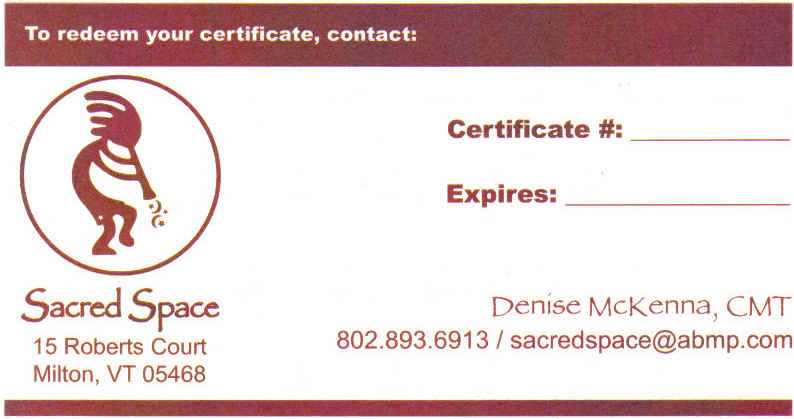 A copy of the gift certificate can be sent via email to the recipient, after payment is received. You can call or go to the contact information page and email Sacred Space your request.